Marchionne pins success of Fiat Chrysler plan on U.S.
Marchionne: Alfa prototype shows "we are on the right track." TRENTO, Italy (Reuters) -- Fiat Chrysler Automobiles CEO Sergio Marchionne said a good performance by its U.S. operations will be crucial for the success of the company's recently announced business plan. The automaker launched a breakneck global growth effort last month built around its Jeep, Alfa Romeo and Maserati brands. The business plan aims to boost sales by 60 percent and increase net profit five-fold by 2018. "The execution of the [Fiat Chrysler Automobiles] business plan announced on May 6 depends on the fact that the U.S. operations perform well," Marchionne said at a business event Sunday in the Italian town of Trento. Marchionne said the company needed cash from Chrysler's U.S. operations to fund its strategy in Europe, where Fiat was still battling with a weak and fragile economic recovery and the market’s overcapacity for mass-market brands. Chrysler filed for bankruptcy in 2009 and received a U.S taxpayer-funded bailout. Fiat took over the U.S. automaker at the time and completed the buyout at the beginning of this year to become the world seventh-largest carmaker. The group is preparing to move its main listing from Milan to New York by the end of this year. Marchionne said Chrysler's financial strength and commercial clout overseas would help Fiat boost sales of Alfa Romeo, which under the plan will build eight new models by the end of 2018 thanks to investments worth 5 billion euros ($6.8 billion). "On Friday I saw the prototype for one of the new models engineers are developing in secret, and I can say we are on the right track," he said, adding that the model would probably be unveiled in the third quarter of next year. Marchionne confirmed that all Alfa Romeo cars would be produced at Italian plants, at least until 2018, and said he would ask the government of Prime Minister Matteo Renzi to take measures to facilitate exports. "I am not asking for financial aid. I am asking for logistic, regulations ... changes to help exports," Marchionne said, lamenting that he had not received any such help from Renzi's predecessors. Marchionne aims to boost Alfa Romeo's global sales to 400,000 vehicles in 2018 from 74,000 last year. Alfa's entire future lineup will be underpinned by a new rear-wheel-/all-wheel-drive architecture called Giorgio. Marchionne, who in the past ignored opposition from Italian labor unions and industry lobby Confindustria to negotiate company-level job contracts at Fiat plants, voiced support for the 39-year-old Renzi, who took office in February. "I like Renzi very much; I hope he will find support for his agenda ... it is the only agenda we have both in Italy and in Europe," Marchionne said. Renzi has promised to try to focus euro zone policies on growth and employment and away from austerity during the six months that Italy will hold the rotating European Union presidency starting in July. 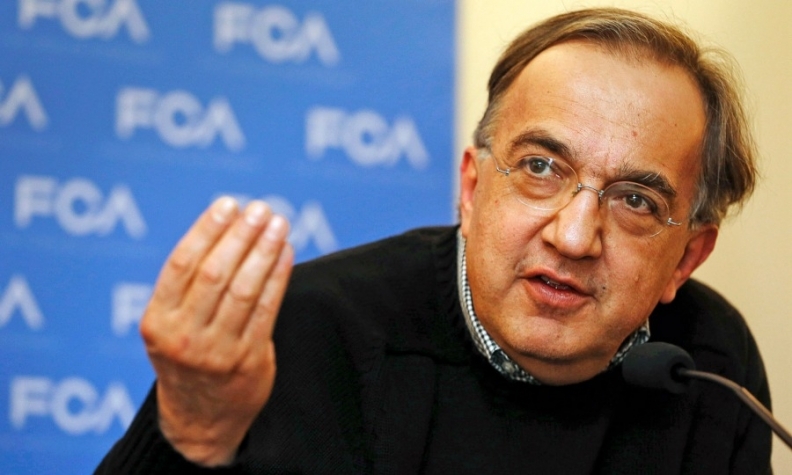 Said Marchionne: "The austerity that came from Germany doesn't make any sense for Europe now."